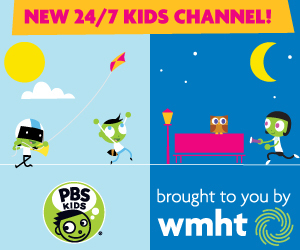 Premieres September 15, 2014 at 10am on WMHT TV! Sesame Workshop, the nonprofit educational organization, launches Sesame Street’s 45th anniversary season on PBS KIDS September 15th. A bonus half-hour program that will air on weekday afternoons and weekend mornings, complementing the regular weekday one-hour series, also debuts in September. 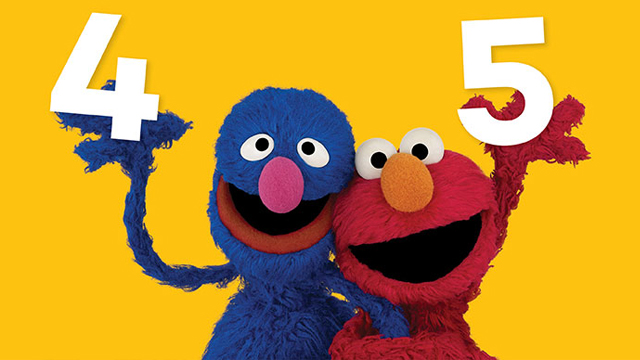 Season 45 of Sesame Street will be the most danceable, the most musical and the most high-energy season yet and is sure to get kids up and moving with new letter and number of the day dance breaks and new original songs! Additional highlights include new street stories; new installments of the wildly popular“Cookie’s Crumby Pictures;” new “Elmo the Musical” and “Super Grover 2.0” segments; new animations and, as always, new hilariousspoofs and celebrity appearances! Sesame Street’s new afternoon and weekend program on PBS KIDS will offer families even more access to the iconic series that for decades has helped kids grow smarter, stronger and kinder. Each half-hour episode is a shortened version of each one-hour program and will include a “Street Story,” a “Word on the Street” segment, a celebrity vocabulary segment, songs, spoofs, letter/number dance breaks and popular segments like “Cookie’s Crumby Pictures” or “Super Grover 2.0.” In addition to airing on PBS stations, selected episodes of the 30-minute show will also be available for free online at pbskids.org/video, on the PBS KIDS Video App, on Apple TV and on the PBS KIDS Roku channel. The dancing and musical fun never stops on Sesame Street! New interactive breaks have been built into the show that encourages kids to get moving while they learn the letter and the number of the day. Preschoolers will be grooving to new original songs “The Power of Yet,” sung by Janelle Monáe, and “Two Different Worlds,” sung by Ed Sheeran; spoofs of popular songs sung by One Direction – “What Makes ‘U’ Useful,” and Macklemore – “Thrift shop;” and remakes of classic Sesame Street songs sung by Michael Bublé and Taye Diggs. As always, Sesame Street is filled with hysterical moments for both children and their caregivers. This season’s spoofs include: “House of Bricks,” a spoof of the television show House of Cards where the Big Bad Wolf blows down and subtracts the Three Little Pigs’ houses until there’s only one left… the White Brick House. In “Game of Chairs,” a spoof of the television show Game of Thrones, Grover competes to be king or queen by playing a suspenseful game of musical chairs. Eight new “Cookie’s Crumby Pictures” spoofs, including “Star S’mores,” “Nosh of the Titans,” “Twilight Breaking Cookie,” “When Cookie Met Sally,” “The Cookie of Oz,” “Furry Potter and the Goblet of Cookies,” “The Aveggies” and “Jurassic Cookie” will keep children and their caregivers captivated while teaching preschoolers critical self-regulation skills. An impressive line-up of celebrities and headline makers are featured in the new season, including First Lady Michelle Obama, Academy Award-winning and nominated actors Viola Davis, Jonah Hill, Sir Ian McKellen and Lupita Nyong’O; Golden Globe-winning and nominated actors Emily Blunt, Zach Braff, Claire Danes, Tina Fey, Jane Krakowski and Emmy Rossum; Emmy Award-winning and nominated actors Zach Galifianakis, Christina Hendricks, Mindy Kaling, Jack McBrayer and Zachary Quinto; Grammy Award-winning musicians Michael Bublé, Macklemore, Josh Gad, Janelle Monáe and Ed Sheeran; SAG Award-winning and nominated actors Taye Diggs, Wendi McLendon-Covey and Craig Robinson; Image Award-winning and nominated actors Terry Crews and Nia Long; Pitch Perfect’s Brittany Snow; 22 Jump Street’s Ice Cube; Saturday Night Live’s Bill Hader and Taran Killam; 2 Broke Girls’ Kat Dennings; Late Night’s Seth Meyers; Thor: The Dark World’s Zachary Levi; British super-band One Direction; Parks and Recreation’sAdam Scott and Aziz Ansari; Watch What Happens: Live’s Andy Cohen; and NBA All-Star Pau Gasol. The 45th season of Sesame Street continues its long tradition of teaching children important lessons. This season, the curriculum focuses on school readiness and the fundamental skills needed to do well in school and life. Young children live in two different worlds – home and school – and need to build their flexible thinking skills to navigate these worlds to make a successful transition to kindergarten. Based on a recent report, over 40% of children enter kindergarten with one or more risk factors that can negatively impact school success (which includes both academic and behavioral skills). In fact, Kindergarten teachers view self-regulation skills, such as impulse control, following directions and monitoring emotions, as essential skills for school readiness. New street stories and segments will not only highlight the 45th season’s curriculum, but also delight fans of all ages. In “Numeric Con,” a Comic Con-like number convention, with number-inspired superheroes like Fiverine, The Dark Nine, Doctor Two, Cap-ten Kirk and many more, comes to Sesame Street and Elmo helps solve problems using math. In “Friendship Day,” Zoe learns to be careful with the words she uses after hurting Elmo’s feelings over their friendship dance. In “Whose Nest Is It Anyway,” Chris encourages Big Bird to speak up and express how he feels when another bird takes his nest. Additionally, both sesamestreet.org and pbskids.org/sesame will have new games launching this fall. On Sesame Street’s site, Grover is your train conductor in Grover’s Rhyme Time Express!, but he needs a rhyming expert to step in as engineer. Children will use an array of skills to control the train’s speed, choose correct freight cars, and collect lots of rhyming cargo on your way to Sesame Station. Abby’s Sandbox Search on PBS KIDS’ site focuses on letters, letter sounds and alliteration. When Abby is searching for all sorts of objects in her favorite sandbox, players will dig in the sand to uncover objects that start with a specific letter.